3. 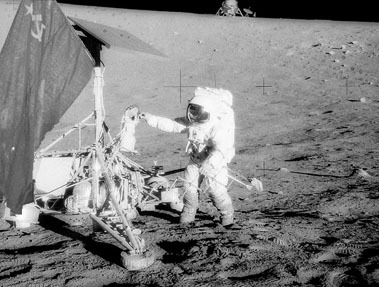 Ongoing misinformation campaign (PROJECT ARMSTRONG) with the goals of (a) ensuring all information concerning SCP-XXXX is confiscated, classified, and/or publicly discredited (this includes falsifying historical documents as necessary); and (b) glorifying the Apollo 11 mission in popular culture via anomalous media compulsion tactics and funding of relevant operations. Note from Project Lead: Further work with MB/EK/PM not advised. Photograph taken from an exterior camera on the 7K-L1 landing module. 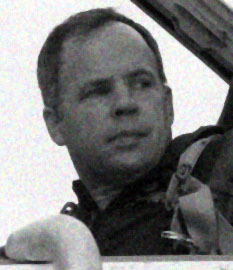 Identity of the cosmonaut is uncertain, but believed to be Commander Seryogin based on fragmented radio transmissions. Anomaly Description: SCP-XXXX designates the successful moon landing by the Soviet Union on November 3rd, 1968. The Soviet space program had developed the "Zond" lunar lander in secret, based on modified Soyuz orbiter designs. The four-man crew made a safe descent onto the surface of the Mare Frigoris, near the lunar north pole. Based on continuous information exchange with Group of Interest 8.1935 (GRU Division "P"), as well as independent research, it has been determined that an anomalous lunar organism (EoI-1131968) was responsible for the deaths of the crew and the failure of the mission to return to Earth. Gagarin and Seryogin exiting the lander. The Landing Team (ребята на луне) touched down on the lunar surface, set up a rover/probe to collect data, moved samples of moon rock to storage pods on the ascent module, and (attempted to) set up a retroreflector array. The Orbiter Team (красные в космосе) remained on the orbital command module, collecting various spectrographic data, reviewing systems and performing maintenance, and preparing the cabin and docking system for ascent rendezvous. Official Cause of Death: Jet crash caused by meteorological conditions. Official Cause of Death: Jet crash alongside Gagarin. Official Cause of Death: Shot down by Luftwaffe pilot during air battle. 7K-L1 capsule and ELV assembly. Official Mission Result: Block D stage exploded on pad, killing three personnel and canceling the launch. SCP-XXXX-1, photographed near the lunar north pole, 1969. Ancillary Containment Procedures: Unnecessary. SCP-XXXX-1 is believed deceased following a hostile encounter with SCP-3609 circa 1983. Former Containment Procedures: SCP-XXXX-1 is currently uncontainable. Protocol consists of eliminating any evidence of the entity from non-Foundation space telescopes. Should Project Thoth be deemed feasible in the near future, the primary goal of project staff should be the containment or neutralization of SCP-XXXX-1. Description: SCP-XXXX-1 was a large serpentine entity resembling Lampropeltis elapsoides, formerly inhabiting the Mare Frigoris region of the lunar surface. Specifically, it was most often observed coiling its body (estimated at 235 meters in length) in the shadows of impact craters, displaying a preference for the Harpalus and Foucault terraced rim walls. Due to the limitations on observation, behavioral studies have been inconclusive, however, it is believed that the entity was either resting3 or attempting to conceal itself. When questioned, SCP-2686 displayed no apparent knowledge of SCP-XXXX-1. Researchers have concluded that SCP-XXXX-1 generally avoided other anomalous entities, only attacking the Soyuz 7K-L1 crew because they entered its "territory" and were not considered a threat to itself. Foreword: The following transmissions were recorded by Foundation satellite Seraph-2180 during the landing of the Zond 7K-L1. All speech has been translated from Russian. Budanova: Command, be advised, Zond is approaching the separation point. We have visual on the lunar north pole. Seryogin: Yuri, we're about seven degrees off on attitude. GET of the separation burn is 100:39:50 even. Seryogin: F:8 at'l/250th. And check that f-stop again, it slips off every damn time. Seryogin: Looking good. God, what a sight. The simulator has nothing on this. Gagarin: Tracking is go. Ready to separate and begin landing maneuvers. Budanova: Affirmative. We'll need one or two lateral thrusts then you should be all clear. Budanova: 1:B6:14.07; …plus 0009.8; 0057.2, plus 0008.5, 0076.4, 0:BO; 000, 293; minus 0075.9, plus all zeros, plus 0009.0; NA. Gagarin: Pitch, minus 20. Phasing looks good… burn is complete, residuals nulled. The lander is free and heading for touchdown. Gagarin: —[EVA? Lunar suit?] ready. Cycling the airlock. Seryogin: Six point five… Three point one… point nine… airlock opening now. Gagarin: Mother of God. It's gorgeous. Seryogin: It's all yours, Yuri. Gagarin: You go first, my friend. I have had my share of fame. Take this for yourself. Seryogin: …Thank you, Yuri. (Long, deep breath. Heart rate increases to the point that it is audible.) Descending to the lunar surface now. Budanova: —talking at the same time. Komarov: Yes, okay. You want me to — to just to turn up B now? Komarov: Hello, Command, this is Seryogin, over. Budanova: A lot of static on the, on the command module S-band. Komarov: Well, we— we should still have him. Budanova: Radio check on S-band. Komarov: I've got nothing but static. Budanova: Are you transmitting on B? Budanova: What are you transmitting on? Komarov: Say again? I'm about to get new high-gain angles— Oh, Christ! Budanova: I see it. Remain calm. (into radio) Landing team, come in. Yuri? Vladimir, come in! What the hell is happening down there? Budanova: Gagarin is one of our best pilots. If he's alive, he's in the module, and he can ascend. I'm making the rendezvous descent. Representatives at the Artemis Conference, 1968. Archivist's Note: For the purpose of clear presentation, all dialogue has been translated into English and all instances of lingual interpretation have been removed. Full unedited documentation is available upon request. [SCPF] Machoi: Thank you all for being here this morning. We have much to discuss, but the Foundation hopes to resolve these issues with cooperation and diplomacy. [GRUP] Nikolaev: Thank you, Director. [USSR] Podgorny: (interjecting) So what is this all about? [SCPF] Machoi: Mr. Chairman, I assume you are familiar with the Zond lander project. [USSR] Podgorny: (turning to GRU agents) How do these Americans know about—? [GRUP] Larionovna: We told them, sir. Please, everything will be explained. [SCPF] Machoi: And with all due respect, Chairman, the Foundation holds no affiliation with any national government. Our commitment is only to the human race. [USSR] Podgorny: (scoffs) How very noble of you. Nobody speaks for several seconds. Larionovna whispers to Podgorny; her speech is not intelligible on the recording. [USSR] Podgorny: (sighs) All right. I will hear you out. Do not waste my time. The following messages have been released as part of the SCP-XXXX documentation archive. Content: This is a direct order from the offices of O5-6 and O5-10: [SECURITY CODES REDACTED]. The Apollo 11 mission must be redirected to a different landing area at all costs, to avoid military/civilian contact with Entity of Interest 1131968. A projected 'safe zone' of at least 1000 kilometers is advised. You are officially authorized to use anomalous means of coercion should it be deemed necessary. Until containment can be established, there are to be no lunar landings in the Mare Frigoris or Mare Serenitatis. Additionally, Overwatch has appointed Deputy Director Hourdoon to lead a new research task force. Lunar Investigation Commission V-2000 will be responsible for: cataloging known lunar anomalies (LnAs); covering up any evidence of LnAs; and investigating any potential pathways for sustainable containment of LnAs. Assignment of additional personnel to this commission is left to your discretion. Complete project details will be forwarded to all relevant personnel, including yourselves, in the coming weeks. NOTE: The original text of this correspondence was interlaced with a prototype Prayther-Berryman compulsive meme. Efforts have been made to disable it; however, due to the unreliable nature of early experimental memetics, personnel with a low MARS index (<3.1) may still experience minor cognitive effects. Proceed at your own risk. Mare Frigoris and Mare Serenitatis are out for landing. New data from Surveyor indicates that a slight correction of Site 2 would be best. The area we've picked out is in the Mare Tranquillitatis; selenographic coordinates are 00.67408° North, 23.47297° East. With your approval, we will inform the rest of the flight crew. Content: The ḍha-3 team splashed down near Okinawa yesterday. They're in decon at 45. Mission was a complete success. It's easy enough to piggyback a satellite on a NASA launch, but getting men in orbit remains a logistical nightmare. Content: Sir, I think you need to see this. It's a report from task force command. Pendergast called it a wild goose chase, but I think it's the breakthrough we've been waiting for. Further details are pending at this time. ussr_lander.jpg is created from VM_1954.jpg and Surveyor_3_Conrad.jpg, both in the public domain. 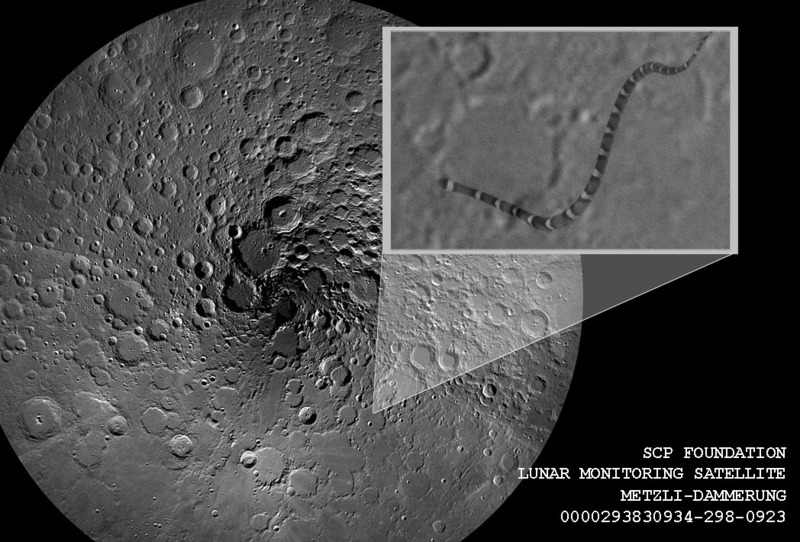 moonsnaker.jpg is created from SMKS.jpg and LRO_WAC_North_Pole_Mosaic_(PIA14024).jpg, also both in the public domain. 1. Originally proposed by Dr. Higans, Eparch is an esoteric class denoting an item with anomalous circumstances or relationships rather than direct anomalous effects. 2. Now defunct, Marine Task Force Boreas-7 ("Litke's Lovers") was in charge of Foundation naval operations in the Austral Ocean and Arctic Mediterranean Sea from 1913 to 1996. 3. Despite not displaying a need for other biological functions such as hydration, SCP-XXXX-1 was often observed to stop moving for several days at a time, suggesting it did indeed require sleep. 6. Dir. Kranz and the late Prof. Seamans were both undercover Foundation operatives, inserted into the agency (along with several engineers and other personnel) to monitor the Space Race. No agents ever infiltrated the Soviet space program, as the operation was postponed, citing already-tense GRU-P/Foundation relations; it was later deemed unnecessary in the late 1980s due to the decline of the USSR.